Jim & Martin get together to chew the fat over individual Doctor Who stories and invite you to do the same. In each podcast, a televised Doctor Who story will be discussed and the next one announced, giving you time to see it yourself and add your own views to the next podcast. 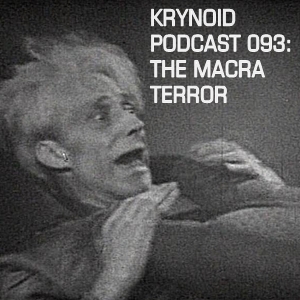 Find us at https://krynoidpodcast.wordpress.com/ and on Facebook at http://www.facebook.com/krynoidpodcast. 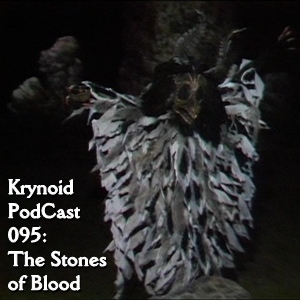 Email us at krynoidpodcast@gmail.com and follow and tweet us @KrynoidPodcast on Twitter. "He says he's a frog doctor, sir." Let's have some fanfic where the Troughton and Whittaker Doctors combine forces to heal a lonely amphibian universe. Actually... let's not. No, this is The Highlanders, where you could be excused for thinking the Doctor's bizarre accent was French and that his hat was a Goth's traffic bollard. It's a second outing for the second Doctor but 18th Century Scotland fares poorly on Cosmic Trip Adviser, with its dog biscuits, corked wine and one-star wet room. And you'll find the locals unwelcoming and the English tourists somewhat invasive. "There's your monster maker... Caught in the act." And lo... Barry Letts did advance upon him, spitting tacks and brandishing a rubber T-Rex, with insertion on his mind. Yes, this is yer actual Invasion of the Dinosaurs - a tale of double talk, double-crosses and double denim. The Doctor drives stuff, Sarah discovers stuff and Yates says "Stuff you!" to his UNIT family (and to everyone outside the central London elite bubble). Have the cast been selectively aged and rejuvenated by Whitaker's time experiments? Will Lis Sladen ever get the underwear she doesn't need? So the JN-T holiday charabanc ends up in Spain in 1985 and his latest jaunt promises country yomps, moth collecting and acid sports, with dinner thrown in - several times over. 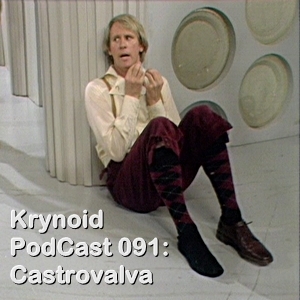 The Two Doctors manage to keep out of each other's way for the most part as Sixie angles for centre stage, leaving his former self to a compulsory makeover, while Peri tries a new accent and Jamie just tries it on. "Now go on. Ben can catch his ship and become an Admiral and you, Polly, you can look after Ben." The Doctor reminds Ben and Polly they're back in 1966 - a time (and indeed date) menaced by War Machines, alien shape-shifters, Daleks and gender stereotyping. The Doctor wears a barrister's wig, Romana sports a chav cap and Vivien Fay shows off her deep silver tan. Professor Rumford forgets her words and her bra but remembers her truncheon, and K9 spills his guts while being goosed by a jack plug. And , at its centre, we have our 'hero' who tries to bluster, cower, whine and strangle his way into our hearts, and his poor sidekick, who has probably never felt quite so sidelined - or quite so kicked. And imagine old Nick's horror when he woke up after the BBC stag do and found that someone had given him a comedy eye-patch and a joke shop scar. This is, of course, the one where Susan turns scissor sister, Ian seems to have been at the BBC brown ale, the Doctor - even with a head wound - still wins Gallifrey's Fastest Butler and poor old Babs has to hold it all together, despite her pathological fear of Salvador Dali. Luckily, Colonel Lethbridge Stewart is at hand, with his ever-shrinking batallion, while Ann Travers proves adept at rebuffing both amorous advances and unwelcome interviews and, somehow, finds time to smile at a rampaging Yeti.